After finishing my 1965 Malvern Star 2 Star (Part 2) I rode it for a couple of weeks and soon discovered how unresponsive the back pedal rear coaster brake was. In modern traffic conditions it's important to have the ability to pull up fairly quickly, but the Perry coaster hub with a rear pedal brake on this build was not reliable, even dangerous. Even a major effort pedalling backward did not provide much 'braking' assistance. I live in a hilly area and I also found that the coaster hub created another problem. When starting on a hill I could not rotate the pedals backwards to put them in an ideal position to start pedalling....so not being happy with the setup I made some changes. Firstly I hunted down a NOS vintage chromed 40 hole hub with freewheel threading. I was lucky enough to find this hub on eBay and paid very little for it. It is a Phillips brand hub, made in England in the 1950's, so when I got it I took it apart and had it regreased. After a polish it came up beautufully. 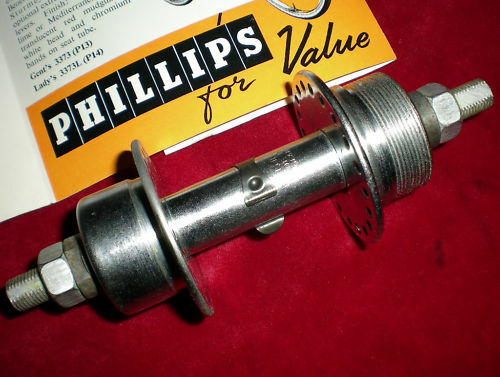 1950's NOS Phillips 40 hole rear hub. My friend George laced the hub into the chromed Westwood rim and it looked great. After looking at gear ratios on the Sheldon Brown site and at http://www.bikecalc.com/gear_ratios I decided to fit a 19T freewheel to the hub. This gave me a neutral gear ratio (46T front, 19T rear) that provides for easy pedalling in most terrains. The next issue to address was that of brakes. I managed to get hold of a set of chromed steel long reach calipers from George and, after giving them a polish, I fitted them to the bike. I also had the matching Dia Compe brake lever and once cabled in I used some stainless steel Dia Compe cable clips to run the brake cable along the top tube. Stainless steel Dia Compe cable clips. ﻿Having ridden the bike for a a few weeks now with the current setup I am very happy. It pulls up to a stop very well and now that I have two brake levers on the drop bars it looks and feels more balanced. Happy days!! Vintage NOS Dia Compe levers. My 1965 Malvern Star 2 Star. Please find related posts as below. I realise this is an old post but love what you did with the 2-star. I am attempting to tackle my first restoration with a vintage 1930's 2-star with cyclo 3 speed in time for the Beverley Heroic. Just wondering if you had any suggestions for sourcing parts. My cyclo 3 speed is missing shifter and cable and trying to find the right bearings for headset and bottom bracket. Lookslike southside powdercoat is the place to go for a sandblast and powdercoat. At the minute there are 3 speed Cyclo Benelux parts (rear derailleurs, cabling, and shifting levers) offered on eBay from different sellers. Most of these come from the UK so expect shipping to take a couple of weeks. These parts are auctioned regularly and often sell for reasonable prizes. Pay with Paypal and minimise the risk of buying on-line.